Spoke to the surgeon and she said she did really well. She commented that Loretta must be a really cheap date because they didn’t have to use much sedation to knock her out. They only did local anesthesia so she was really just napping. So recovery should be easier. We should be able to see her in the next 30 mins or so. This entry was posted in Treatment Updates on August 21, 2013 by Scott Stanton. 15 minutes early. It should take about an hour. She might get started around 10:30…..
Fiona is here to help. Loretta is chillin while we wait for them to start the first procedure of the day. They are going to insert a guide wire for the surgeon to follow as she takes the additional margin that they wanted. She is in having it done now…. 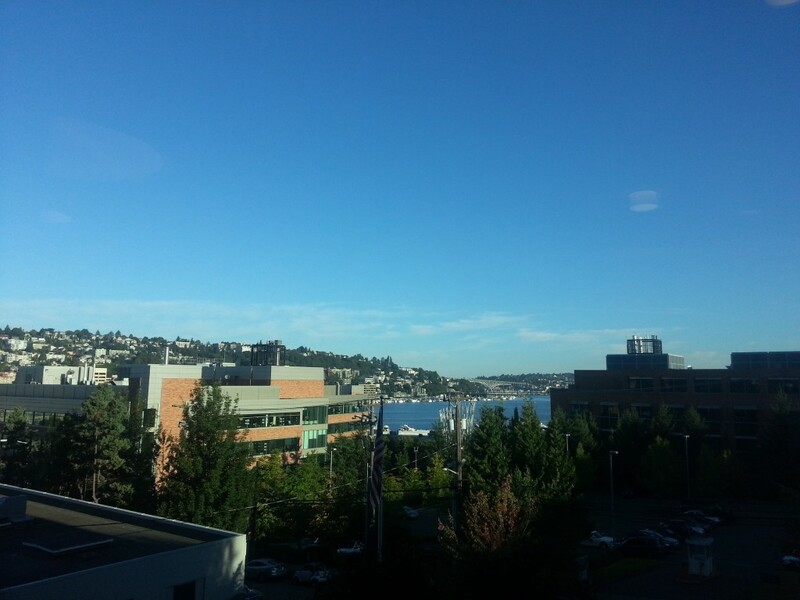 It’s a beautiful day in Seattle (it’s always like this – ask anyone) but we are looking forward to this day being over. I will update the blog as things happen. Yesterday was the first Monday in a long time that I didn’t have chemo. It was great not going to chemo. I do miss spending time with my various buddies. They were all great and they will never know how much I appreciate the time they took going with me. The weird thing about the last chemo is your brain says “Yay the last one. I am done.” But, your body still has all the same side effects (multiplied by the previous 15 infusions) it did the prior week. These side effects will last several weeks. Just in time for surgery! I am scheduled for surgery on August 21. Some additional (2mm) margins will be taken where the DCIS (ductal carcinoma in situ) was located. The surgeon will do a touch up on the scar from the previous surgery. And, she will remove my port! I am so happy to have my port removed. I have a real love/hate relationship with my port. It has served me well but it is time for it to go. Sometimes I think it wants to leave on its own. So, I bid a fond adieu to my Bard, single septum, Power Port. This entry was posted in Treatment Updates on August 13, 2013 by Loretta Stanton. YAY!!!! This leg of the journey is over. I had my last chemo this afternoon. 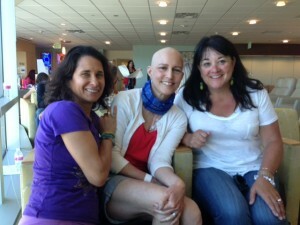 Alexa was my chemo buddy the first part of the day and Roberta was my chemo buddy the second half. I can’t say it enough – I am very lucky to have such great friends and family. 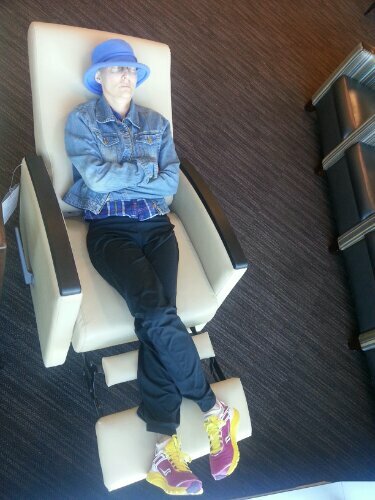 There are people who show up for chemo all alone. I am also very thankful for the lab staff and the chemo staff at SCCA. From the check in people to the nurses. They greet you with a smile, get you warm blankets and even decorate your id bracelet with stickers for your last day. This is Bo. He works in the lab and accessed my port 9 of the 16 chemos. 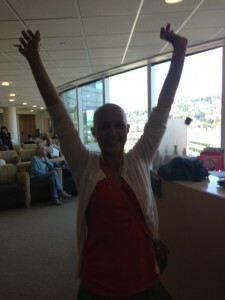 This is me checking into chemo for the last time. 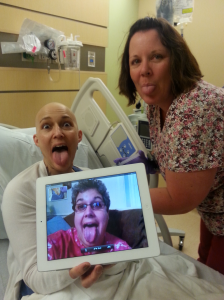 Alexa, me and Roberta waiting to be called for chemo. Cathy, my nurse, and me. 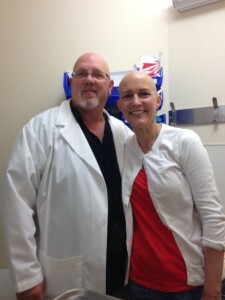 Cathy was my nurse for my first and last chemos and several in between. 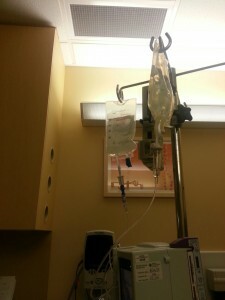 The bag on the left is the Taxol and it is empty! I still have to get through the next couple of weeks of side effects but should start to feel much better after that. The next leg of this journey is margin surgery on Aug 21. But for tonight I am going to celebrate the completion of chemo with Scott and a couple of glasses of sparkling apple cider and a great meal provided by Micheal. This entry was posted in Treatment Updates on August 5, 2013 by Loretta Stanton. Well this post is just a bit late! What a week it has been. It started out like the previous 11 weeks, Chemomonday. My buddy for the day was Alexa. Thank you Alexa. We did the usual – take the ferry and walk to SCCA. We stopped at Whole Foods on the way to pick up lunch and for me to hop into the bathroom to apply Lidocaine and Saran Wrap to my port. I know the bathroom code by heart. They never seem to change it. We then finished the walk to SCCA and checked into the lab. While hanging out, my left ear started get red and hot, what I call Hot Ear. It occasionally happens to me and goes away after a bit. Well this time it didn’t go away but continued to spread until both ears and my face were red. This was not the flushed face I usually get on Tuesdays after Taxol. This was the white eyed, red faced, raccoon look of an allergic reaction. It was red and hot and hot and red. A very attractive look to accompany a bald head and angry, rashy arms. 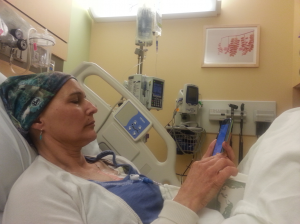 Cathy called the lab to see if they had used anything new while accessing my port. They hadn’t. She then talked to the oncology nurse who talked to the oncologist. 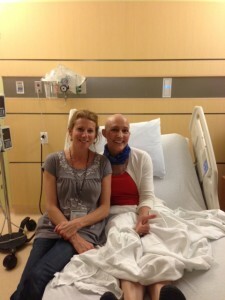 Those chemo nurses are on the ball and take really good care of their patients. I was given IV Benedryl for the allergic reaction. In about 10 minutes my face started looking better. in about 20 minutes it was almost back to normal. No one knows what happened, just one of those mysterious things. It happened again the next day, but not to the same extent. As for my foot, again, who knows what is happening. I was told to soak it in an astringent solution and apply Neosporin. It was so much better in a few days that it is hard to believe how bad it had looked. On Tuesday, we moved. Yes, we moved. We moved about 50 yards into our construction zone. I hired Hill Movers and they sent three guys to carry our belongings from one 3 story townhouse, 50 yards down the street, into another 3 story townhouse. This is almost like a movers worst nightmare. Loads of stairs in both homes with no driving break in between. They were awesome! And they were tired. David and his friend Nick stopped by and helped with the move. On Wednesday my dear friend (and Realtor) Eileen came to help me move the rest of the stuff that the wasn’t ready for the movers. It turned out to be way more than I thought. Eileen must have made twenty trips (just like the movers) to the new townhouse. We got some unexpected help from a friend and his two boys who happened to be in town on a visit. Thanks Jim, Logan and Taylor. Wednesday night, the move was finally complete. Eileen, you rock and I owe you big time for all your help. Thursday I was exhausted. Scott came home from work and worked on the house for hours. Friday I was exhausted. (I do have a separate story about my encounter with PHONE GUY that my Bainbridge Island female friends will appreciate.) Scott came home from work and worked on the house for hours. Saturday I was tired. Scott worked on the house for 12 hours. Sunday I am tired. Scott is still working on the house. Our contractor has been working as much as possible but there is a lot to do. The final product is beginning to emerge and it is a beauty! Scott has done the lions share of unpacking while installing the kitchen, helping lay the floor, building out a closet, setting up the internet and cable, and doing a million other things. I, on the other hand, feel like a slug. 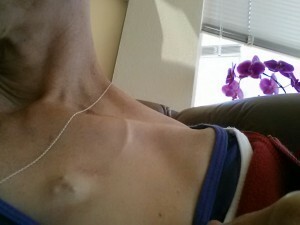 Would I recommend renovating and moving at the end of six months of surgery and chemo? I am not sure I would. But I would recommend not putting your life on hold when a great opportunity presents itself. The cancer treatments are temporary. The renovations are temporary. We seized the moment and we are very happy that we did. 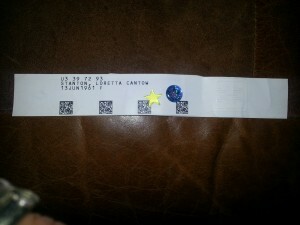 This entry was posted in Thoughts, Treatment Updates on August 4, 2013 by Loretta Stanton. 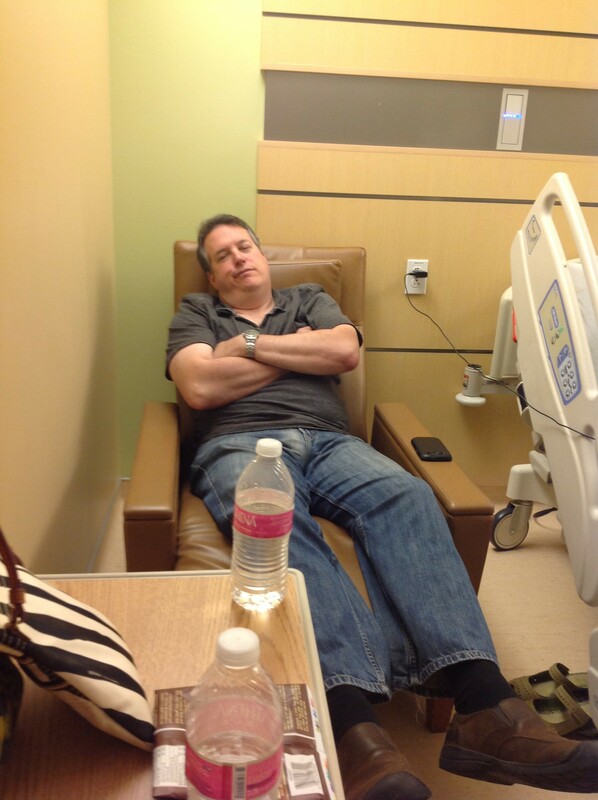 Today was the third-to-the-last Taxol infusion and I didn’t go. David went which was great for both of them, I think. Unfortunately, Loretta is still on The List (and the List Update) but she is too nice to actually use it when she can for her advantage. As it turns out, she wasn’t on the right list (the one that said she was going to show up today), they got a semi-private space, the drugs were wrong, and the nurse was new to Loretta. It’s never like that when I am there. I’m lucky I guess. Anyway, it all came out okay and now she is alternately tired and buzzing around. 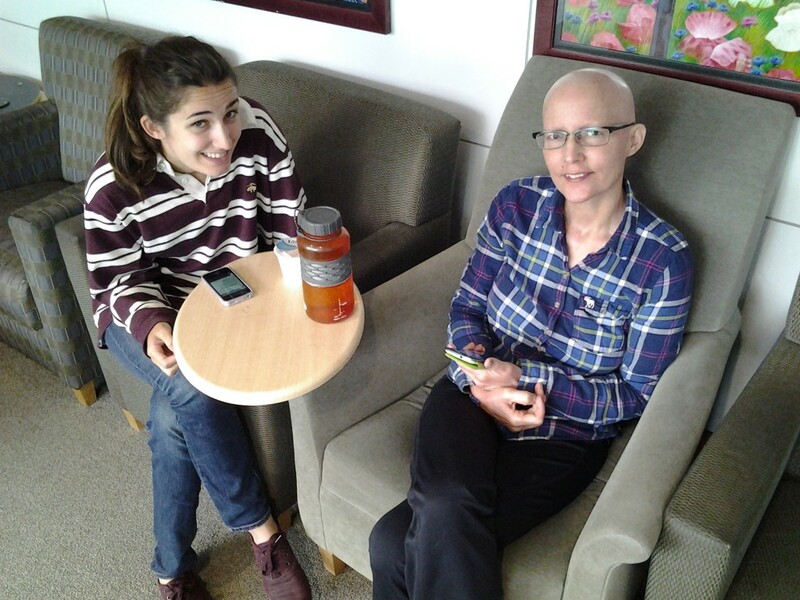 The buzzing comes from the steroids that she gets with every infusion. The tired comes from this being the 14th infusion of drugs that are killing or severely wounding parts of her. Some of you might not know that we came from the East (Right) Coast where we both grew up and lived for the first 17 of our almost 30 year marriage. In the summer on the East Coast it is common to have afternoon thunderstorms that momentarily cool the place off and then add to the steam (the cooling period is anywhere from 10 to 30 seconds after the rain is finished). I loved those thunderstorms. They were sometimes huge and ferocious, sometimes just in the distance so all we heard was the distant rolling thunder. “What’s this have to do with Loretta?” you may ask. Well, last night, she did the most amazing simulation of that distant rolling thunder that I have ever heard. It was like the real thing. Only it was her guts. The Taxol is going after all of the fast dividing cells in her body including those lining her gut – from mouth to [other end]. This often makes it hard for her to eat (the mouth part), painful after eating (her stomach and intestines) and, later, [redacted]. The thunder simulator was the middle part. It sounded like a distant thunderstorm: active, booming, powerful. I thought it was amazing and wonderful. She didn’t share my feelings. She (we) are looking forward to that day when she can really start to heal from the inside out. When she can start to regain her amazing physical strength and rebuild her emotional strength. This has been a hard road and it has made her weak. I still see the glimmer in her eye from time to time and know that it is there waiting for the chance to come back and take control once again. Two more Taxol infusions to go. 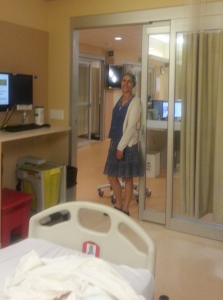 Surgery (which we will find out more about this Friday) and radiation are next. The thunder simulator’s days are numbered. Thanks to all of you. The support we have both received has made this a lot easier. It is hard to imagine going through this without all the support we have gotten. This entry was posted in Thoughts on July 22, 2013 by Scott Stanton. Speaking of oncologists, after monthly visits, I don’t have to see him for three months. We talked about the on going side effects, particularly the lovely mouth sores. The way to really get rid of them is to delay chemo for a week. Well he know I wouldn’t go for that. 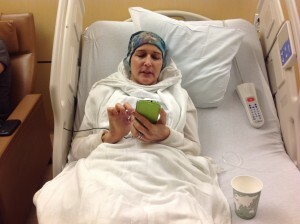 I would rather deal with the mouth sores than prolong the chemo. He did say to me “You know, I threw the kitchen sink at you.” Well sometimes I feel like I was hit by a kitchen sink. This is a picture of me when I was cold. I love blankets out of the warmer. I was still cold. As you can see there is the cup of ice I chew to help with the mouth sores. I don’t wrap my feet in ice anymore. The baby toenails are goners no matter what. I finally warmed up enough to remove some of the blankets. Scott hanging in the chair. Claire took these photos. They were both with me for the day’s activities. Me and my pole posing in front of my room. Claire FaceTimed with Diana. Gabrielle was my nurse for the day. If you look closely in the upper left of the iPad, you can see my port being flushed. Poor Diana, that was what she was watching while we were sticking out our tongues. I have the best siblings in the world! 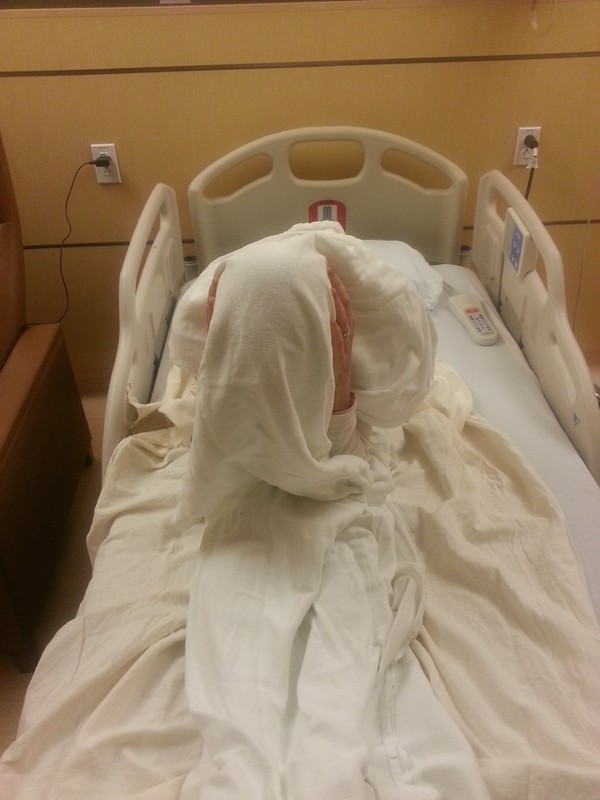 This entry was posted in Treatment Updates on July 16, 2013 by Loretta Stanton. I realize after reading comments that my last post sounded like SCCA is disorganized and full of unnecessary red tape. That was not what I intended to convey with the post. It is very important to keep germs contained to the current germ holder and not spread them. Does everything run as smooth as silk, no, but I think it runs as smooth as it can. Hundreds and hundreds of people are serviced at SCCA everyday by hundreds of hard working people. Do things get mixed up now and then? Of course. But, when I had an issue with an individual in the lab, I left a comment card and was called back with in a few days. Patient services was glad to get constructive feedback and I was happy to be heard. If I need to see my oncology nurse without an appointment, she (or another nurse if she is out) is available by just asking to have her paged. If I call to talk to my nurse, she is either available right away or calls back in a very timely manner. The scheduler for all my appointments works very hard to have my appointments scheduled with the minimum amount of time needed between appointments but not more wait time than necessary. And, I can’t say enough about the chemo nurses. They are kind and patient and knowledgeable. I always feel like I am in good hands during chemo. So, is everything always perfect? No. But rules and regulations are put into place to keep people safe and healthy. I think people need to be their own advocate, need to speak up when necessary and need to appreciate the work of those who deal with many, many people every day. This entry was posted in Treatment Updates on July 12, 2013 by Loretta Stanton.